Happy New Year! As we take a last look at 2013 and say hello to 2014, it seemed like an appropriate time to finish the last page in my second art journal. I began this page at an “Art Journaling with Magazines” class a few weeks ago, and completed it at home this afternoon. This page was made using red acrylic paint applied to the background with a baby wipe. I added white circles using acrylic paint and large bubble wrap, and light blue circles using acrylic paint applied through punchinella (sequin waste). The small black squares were made with acrylic paint applied through drywall mesh. 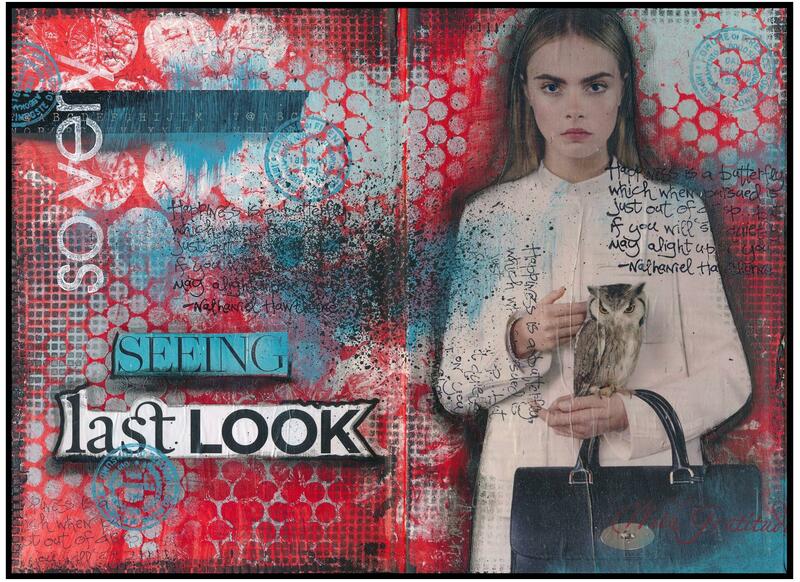 The lady holding an owl (as well as the words “seeing” and “last look”) were cut from magazines, collaged onto the page, and then outlined using both black and gray pens blended with my finger. I added a little washi tape to the upper left corner, and some rubberstamping with white and red paint and black ink. I sponged and rubberstamped some turquoise blue paint onto the page, and also wiped bits of blue onto the page directly from a sponge wedge. The last thing I did was splatter some watered-down black paint onto the center of the page with a toothbrush. This last look at my second art journal coincided with the end of 2013 — a year filled with all sorts of adventures. I wish you all a happy, healthy, and creative 2014!